Are you a deep sea diver? A lap-swimmer? Or maybe someone who spends hours with your kids at the lake? For all you “mermen” out there who still need to tell time while doing your water activities, you now have the Tag Heuer Aquaracer Grande Date Men’s Watch CAF101F.FT8011 to call your new favorite water toy. Designed specifically for water activities, this timepiece from the Aquaracer collection combines the nazzy sophistication of the regular Tag Heuer watches with the capabilities that cater to water athletes. Like most watches the case and bezel are made with stainless steel. On a silver dial there are tick marks at every minute; bolder silver tick marks at each hour, and a date display just below 12 o’clock. The bracelet is made of black rubber material instead of stainless steel, and the Tag Heuer name is embossed across both straps. This isn’t just your basic analog watch – the chronograph component on the face of this watch is just an added bonus to help you time yourself and/or others while competing in the water. But this watch isn’t strictly for the human fish among us – keep in mind that the rubber strap is an optimal choice for anyone, may it be based on comfort or just to keep things more casual in your look! Your best bet is to purchase this watch from one of the following sites: AuthenticWatches.com for $1,495.00, WatchesOnNet.com for $1, 680.00, or Bodying.com for $1,789.00. While it may definitely be worth the money, retail locations could charge a prettier penny for this sporty timepiece. 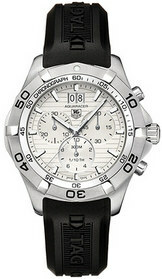 If for some reason you’d prefer a black dial version that is similar to this silver watch, your problem is solved with the Tag Heuer WAP1110.FT029.